NOTE: In celebration of George Washington’s Birthday, the Star Spangled Music Foundation will present Poets & Patriots in recital at Stamps Auditorium on the University of Michigan’s north campus at 8:00 p.m. Click here for more information. The wandering apostrophe in the name of Presidents’ Day / President’s Day / Presidents Day has a logical explanation—it turns out that not one of these variants is the actual, official name of the federal holiday. While “Presidents’ Day” is the spelling preferred by most authorities, these names are more advertising copy than law. First approved in 1879, the federal celebration of George Washington’s birthday was held initially on Washington’s actual birthday of February 22 (New Style Julian Calendar) and was first celebrated officially in 1880. 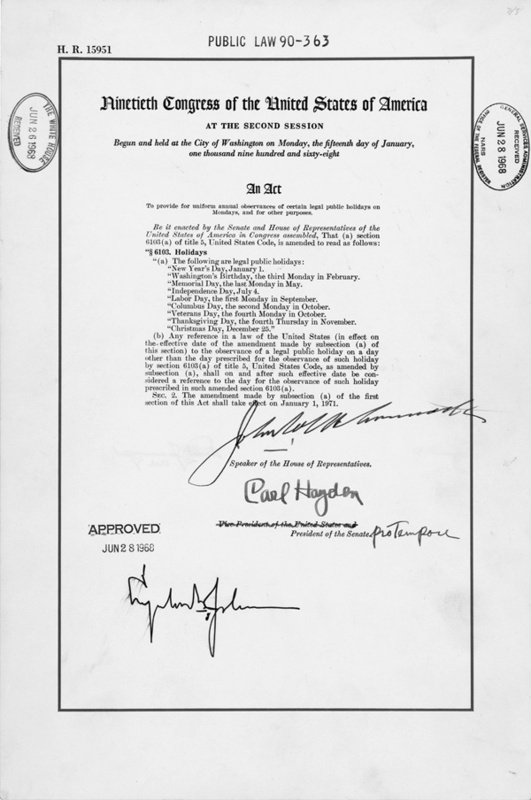 Public Law 90-363 signed into law by Lyndon Johnson by on June 28, 1968 (see image) shifted the celebration to the third Monday in February beginning in 1971. Yet despite proposals to rename the day as “Presidents’ Day,” this law left the holiday’s name as it was — “Washington’s Birthday” — and this remains the most recent word on the subject. As with Key’s anthem, Congressional action to celebrate Washington’s birthday was less an act of creativity than recognition of a community practice, one begun during Washington’s lifetime. Among the earliest American lyrics written to the tune that would be used by Key for his anthem was created by Susanna Rowson to celebrate George Washington’s birthday in 1798. Note: other selections from our Poets & Patriots recording project celebrate Washington. Although written for John Adams, Paine’s text to “Adams and Liberty” arguably offers more praise to the nation’s first chief executive. Among the most interesting early musical variants of the Anacreontic melody is “When Death’s Gloomy Angel Was Bending His Bow,” that mourns Washington’s death. Click here to preview these tracks on iTunes. <1> The complete text of Key’s oration is reprinted in Edward S. Delaplaine’s Francis Scott Key: Life and Times (1937), pp. 105–115. See our books resources page for more info.